Sometimes I forget how satisfying a frittata can be. Aside from being a quick meal, it is a great use to use up vegetables (and anything you want to put in it) that look like they’re getting ready say goodbye. Have lots of half used veggies you need to cook? Throw them in a frittata! 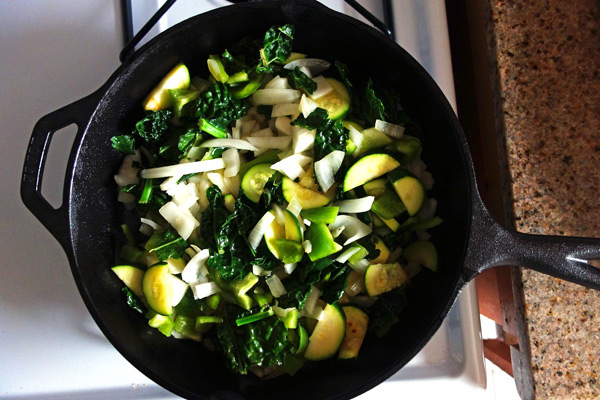 Can you sauté vegetables? Can you add eggs to said sautéed vegetables? Can you put that combination in the oven? If you answered yes to those questions, you can make a frittata! If you answered no, well, I want to help you. A frittata is basically a crustless quiche. Along with the fact that this is not made with heavy cream, this is a much healthier alternative to a quiche. It is filling enough by itself, but you can also serve it with baby arugula salad or toast. I make my frittata in a cast iron skillet, but any non-stick skillet that is oven-safe will work. Before you sauté the diced vegetables, pour the olive oil in the skillet and, using a paper towel, oil the sides of the skillet. This will make life much easier when you remove the frittata for serving. Heat the skillet and sauté the vegetables for about 5 minutes. You don’t want the vegetables to be soft before you put the frittata in the oven. Preheat the oven to 375 degrees. In a medium bowl, whisk the eggs with the milk and seasonings. Pour the eggs in skillet with sautéed vegetables and cook for a couple of minutes giving the eggs a stir a couple of times. This step is going to give you the yummy browning on bottom of the frittata. Let eggs cook for another minute, then remove the skillet from the stove and put it in the preheated oven. Bake the frittata for 20 minutes or until the top is set and begins the brown. If you stick a knife in, the inside should not be runny. Remove the frittata from the oven, don’t burn yourself, and serve it hot. Whisk the eggs and milk in a medium bowl. Add the seasonings. Add olive oil to a cast iron or non-stick, oven-safe skillet. Using a paper towel, oil the insides of the skillet. Heat the oil and sauté the vegetables for about 5 minutes until they begin to soften. Add the eggs and cook for two minutes, stirring twice. Cook eggs for another minute, then move to oven. 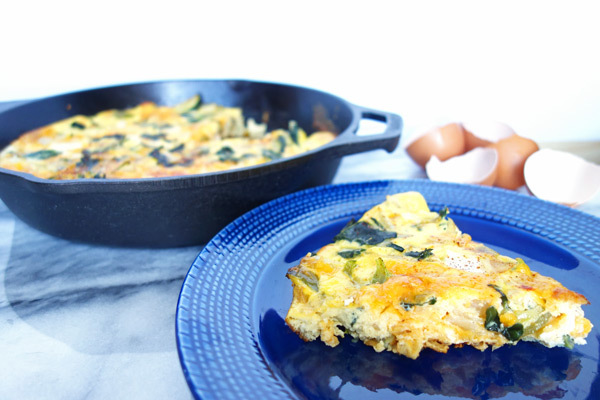 Bake frittata for 20 minutes or until edges begin to brown and eggs are no longer runny. Looks like the perfect frittata and the perfect weekend treat. Love this! Thanks so much, Matt! Big fan of RFBD!